Essential plot rundown: A group of scientists discover a shape-shifting alien. This is suppose to be a prequel to John Carpenter's masterpiece The Thing (1982). However, it feels more like a remake. The plot is basically the same except for, here, we see the discovery of the alien. It reminded me of Let The Right One In and Let Me In. They tell the same story, but do it in different ways. 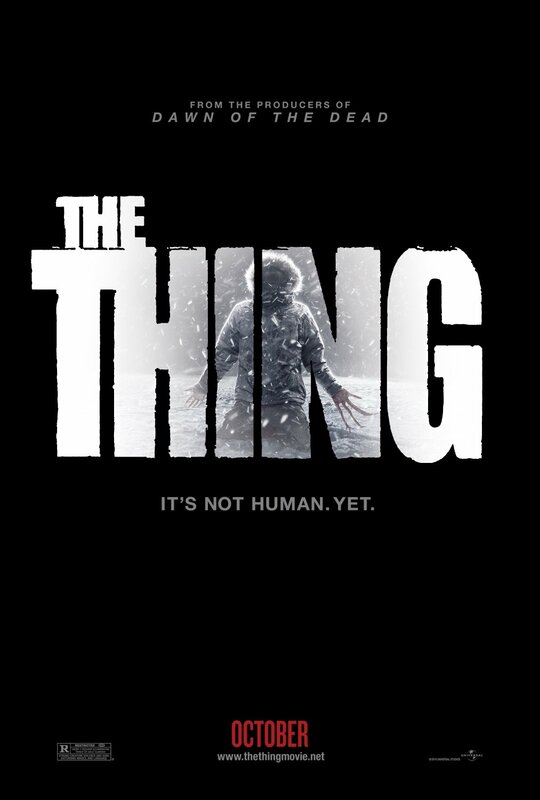 While the John Carpenter's version focuses more on atmosphere and tension, this one mainly uses jump scares and what not. I wanted to be as unbiased as I could while watching this. I wanted to judge it based on its own merits. But I couldn't help but compare it to the original. (Yes, I know the real original came out 1951. But, for the sake of this post, I'll call John Carpenter's version the "original"). And I'll just start with the obvious: the thing. This movie uses CG to create the alien. And it looks fake. Not once did I ever feel like it was actually there. I mean, just look at the above picture: it just doesn't look real! The original used animatronics and practical FX and it looked amazing! It's kind of sad to see a movie look less real than its predecessor from 30 years earlier. And I felt it relied too much on the "monster" aspect of the creature. It can perfectly duplicate an living thing, yet spends most of its time as some gangly mess of grotesque body parts. Now, don't get me wrong, I thought the alien looked cool; it's just over used. (And it looked more like a video game alien than a movie alien). Also, I never cared. For anything. This movie was not engaging at all. I didn't care for the characters. I didn't care for what was happening. And, there were some parts that it seemed like the actors didn't care either. When they first discover the alien, nobody is really excited; they almost act like it's a common occurrence to discover aliens. I mean, personally, I would be freaking out! And there was no rise in energy. (I don't think that's the word I want). I was never scared, nervous, excited, happy, etc. It was an emotional flatline. There was no buildup or anything. Things just kind of happen. So, overall, it's not a bad movie, nor is it good. It's just there. It wouldn't do any harm to see it; but you're not missing out on anything if you don't. And this poster slightly offends me. If I'm not mistaken, that image is taken from the original, not the prequel.